I took Monday and Tuesday off this week. My intentions were to hike San Gorgonio on Monday with my hiking buddy, but she strained a muscle the previous week. Gorgonio will just have to wait…again! Fortunately the Sierra Club had a hike listed in the San Bernardino Mountains for Tuesday. 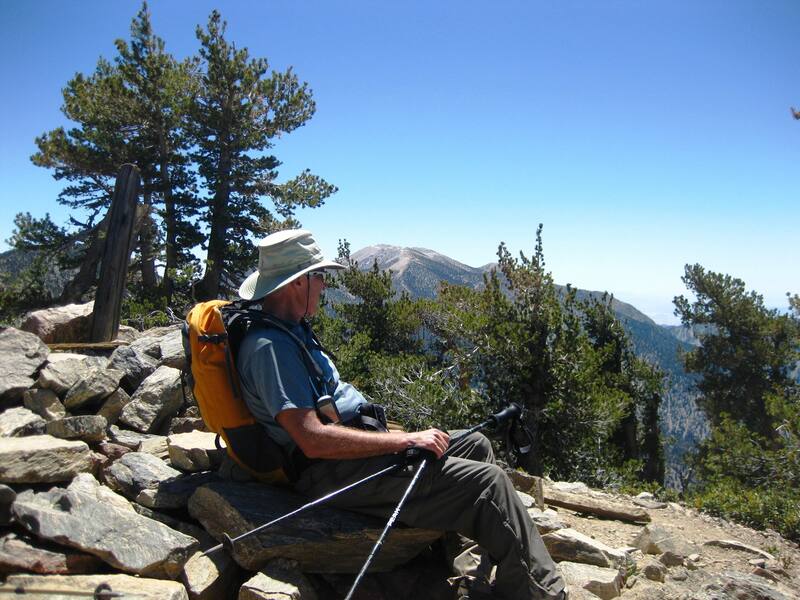 I signed up for the 16-mile round trip hike to San Bernardino Peak. I didn’t know what I was getting myself into as we would have to meet at 7:00am at the trailhead which meant leaving San Diego at 4:30am. Luckily, I met two other hikers in San Diego and we carpooled to the trailhead. Jim was kind enough to drive. We arrived at the Angelus Oaks restaurant around 6:45am, took a pit stop and waited for the other hikers. Everyone (11 of us) showed up around 7:00am. We introduced ourselves, got our packs ready, and hit the trail around 7:15am. The weather was great! We started out in the low 50s, but you quickly warm up as you go up on the San Bernardino Peak Trail. Plus, our leader was going at a pretty good pace, about 2-2.5 miles an hour! The views of Los Angeles were spectacular and the vanilla scent from the ponderosa pine trees was intoxicating. I just love being out there. The highest temperature was probably in the low 70s so it was perfect hiking weather. I was a little worried about it getting too hot so the previous day I made sure to drink plenty of water and eat fruits and veggies. I think that helped a lot because on Wednesday my muscles felt great. I was tired yes, but not sore. We took a few 5-10 minute breaks and maintained a steady pace. Before we knew it, we were having lunch on San Bernardino Peak at 11:30am! We could see San Gorgonio and San Jacinto. After the obligatory pictures and refueling we headed back down to the trailhead. Coming down you see things that you don’t see going up so it was equally beautiful. By 3:15pm we reached the trailhead. Jim had a beer at the restaurant while we waited for our other carpool buddy. Our leader had suggested visiting Hangar 24 Craft Brewery in Redlands, but Jim’s iPhone revealed that they do not serve food. So we opted for Casa Maya in Mentone. They fortunately had Hangar 24’s Orange Wheat which was really effervescent, almost like soda pop. After our break at the restaurant Jim drove us back to San Diego. If it had been me driving, I probably would have fallen asleep. We got back around 7pm, said our good-byes and we all slept like babies that night. Overall, a great day in the mountains.